If you’re a homesteader, you probably have a few rows of garlic planted in your garden bed. Garlic is easy to grow and to harvest, and it is an extremely useful herb. Fresh garlic has been cherished for its medicinal properties for decades. People also use garlic as a surface cleaner, or even to repair glass. And of course, garlic goes great with just about everything. Garlic is absolutely essential in the modern homesteading kitchen. You can use it to turn bland meals into something special. It can help season vegetables and meats that need a little extra help to get past ordinary. And hey, garlic is great on its own as a snack, too. This is one of the most versatile herbs out there. So do you want to get the most out of that fresh garlic that you just bought at the farmers market? Here are eleven great garlic recipes that you should put to use in your kitchen as soon as you can. Fresh roasted garlic is a terrific snack. It has a mild flavor, and is great as a pick-me up while you watching television or reading a book. Pair it with a pinot grigio (or some of your homemade dandelion wine), and it makes a great appetizer when you’re hosting guests at the homestead, too. And when it comes to recipes, it doesn’t get much easier than preparing a dish or two of roasted garlic! Preheat your oven to 350 degrees Fahrenheit. Line a baking dish with aluminum foil, and coat it with the olive oil. Cut the tops off of the garlic heads, and place the heads cut side up on the baking dish. Sprinkle salt and pepper on the garlic heads to taste. Cover the baking pan with aluminum foil, and bake your garlic for approximately one hour, or until the garlic is a golden brown in color. Once they are done cooking, place the garlic heads on a plate with skins on; you can remove the skins easily by hand when you pick up a roasted clove to eat. If you have been to a farmers market recently, or an upscale supermarket, chances are you’ve run into bok choy; maybe you are even considering growing this Asian cabbage in your own homestead garden. If you’ve been searching for another way to cook this great vegetable, look no further; here is a great recipe to turn bok choy and garlic into a spicy side dish. Have plenty of drinks handy, however, this is a pretty hot dish! Heat your hot sesame oil in a large skillet over medium-high heat, ensuring the oil spreads across the heated pan. Once the oil is hot, add in your garlic, and cook it for approximately one minute. Then, add in your bok choy, soy sauce, red pepper flakes, and water. Use your spatula to rapidly mix everything together, then cover your skillet and let it cook for one minute. Uncover, and mix items with your spatula occasionally until the bok choy is tender. Once bok choy is tender, remove the skillet from heat, and your spicy garlic bok choy is ready to serve. Fish with white meat, like tilapia, can be quite bland on their own. One way to make them more exciting is to use garlic to spice them up a bit. While this recipe is for tilapia, it would work equally well for other white fish filets, like catfish, perch, or flounder. Place the ginger and garlic purees, salt, and lemon juice in a medium sized bowl, and mix them together. Add the fish, and cover them with the mixture, and let them marinate in the refrigerator for five to six hours. After the fish is done marinating, heat a skillet over medium heat. Add the butter, and ensure it covers the heated skillet completely. Then sauté the chopped garlic and ginger for two to three minutes in the skillet, until it is sufficiently browned. Add the fish and chili powder, and cook on medium-high heat for two to three minutes. Then, reduce heat, and use a spatula to move and turn the marinated fish occasionally. Your garlic ginger tilapia is ready when the marinade has been absorbed into the fish, and the fish is thoroughly cooked through. Chicken is another food that we don’t give much thought to while preparing, and then hope our families will bury the blandness under a good assortment of tabletop condiments! It doesn’t have to be that way, though; you can use some fresh garlic to spice up your chicken, and have your family coming back for more! So try this recipe the next time you decide to put chicken on the menu. Preheat your oven to 450 degrees Fahrenheit. Line a baking dish with aluminum foil, and coat it with cooking oil or spray. Meanwhile, sauté your minced garlic in a small saucepan over medium heat, until it is lightly browned. Remove the saucepan from heat, and then stir in the brown sugar, salt, and garlic powder to make a marinade. Place the chicken breasts on the lined baking dish, and coat them thoroughly with the marinade mixture you created. Bake them in the oven for approximately thirty minutes, or until the chicken is thoroughly cooked, then it is ready to serve. photo above: a jar of delicious pickled garlic, ready to serve! 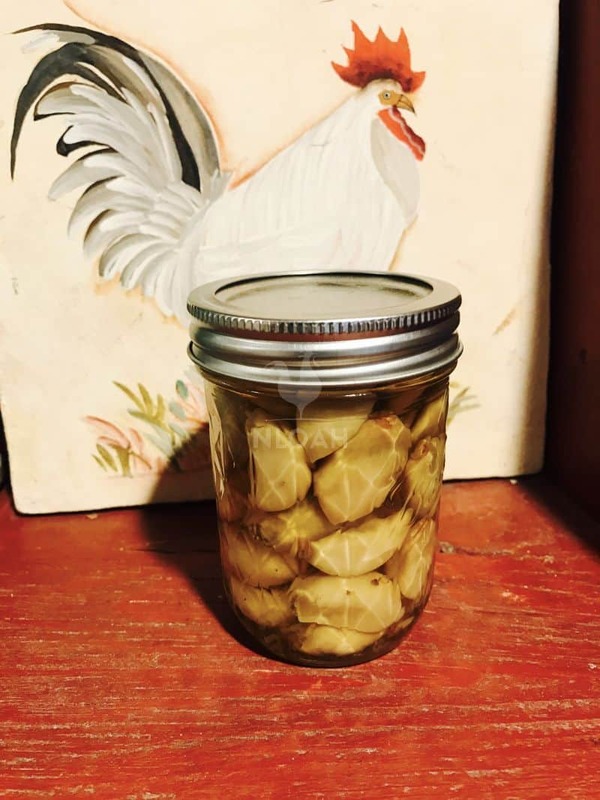 Have you ever tried to make pickled garlic before? 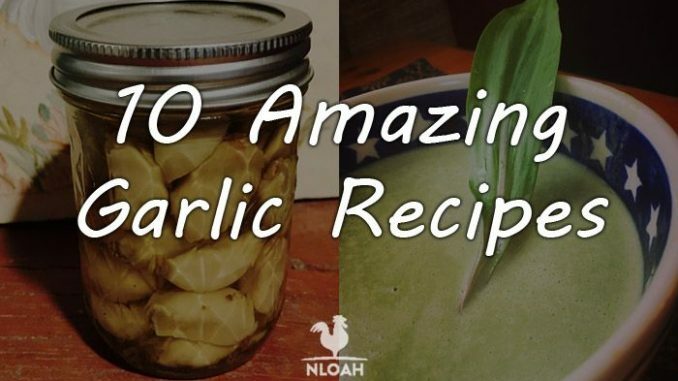 Did you even know that you could pickle garlic? Well you can, and it is absolutely delicious! Pickled garlic cloves are great to enjoy all on their own as a snack or an appetizer. In fact, try not to eat a jar of them all in one sitting. Pickled garlic is also great in salads, spread across sandwich breads, or as a flavorful addition to your favorite pasta sauces, too. And if you can your garlic, you’ll be able to enjoy it all year long. Here is everything you’ll need to make five 8-ounce jars of pickled garlic. Prepare your jars, lids, and bands like you would do for other canning recipes. The most time consuming part of this recipe is removing the skins from your garlic. To do so, separate all of your garlic heads into cloves. You’ll also need a pot and a bowl. Fill a bowl with cold water, then fill the small pot with water, and bring it to a rolling boil on your stovetop. Place your garlic cloves into the boiling water for about 30 seconds, then pour them into a colander, and then place them all into the bowl with the cold water for about a minute or so. Drain them in the colander bowl immediately afterwards. The rapid temperature changes help to loosen the garlic skins, so they should be much easier to peel at this point. Meanwhile, in a large saucepan, combine the vinegar, oregano, salt and sugar, and bring the mixture to a boil over medium-high heat. Stir the mixture until the sugar dissolves, then reduce heat, add the garlic, and cook the garlic in the mixture for one minute. Carefully pack all of your garlic into the canning jars, leaving ½ inch of headspace. Using a ladle, carefully transfer the pickling juice from the saucepan to the jar, again leaving ½ inch of headspace. Once the jars are filled, wipe the jar rims down with a cloth, place the lids center of mass on each jar, and then secure them hand tight with a band. Carefully transfer each jar into a boiling-water canner, ensuring they are completely under water. Put the lid on your boiling-water canner, and bring the jars to a boil. Let them boil for ten minutes, then turn off hear, remove the lid, and let them sit for five minutes. After five minutes, set the jars in a cool dry place, and let them sit for 24 hours. After 24 hours, check all jars for a good seal. Any jars that don’t seal need to be refrigerated, while the others can be stored in the pantry for a year. At that point, your pickled garlic is ready to serve! When your household is down for the count with a winter cold, a can of chicken soup is almost always part of the recovery plan. But instead of that old staple, how about a nice cup of homemade garlic soup for a change? Garlic is renowned for its medicinal properties, after all, and this soup is just plain delicious. The Swiss chard is a great addition, providing important nutrients to help you get back on your feet. So skip the can of chicken soup next time you’re all bedridden, and get everyone back on their feet with this delicious alternative. Preheat your oven to 350 degrees Fahrenheit. Cut your unpeeled garlic cloves in half, then place them, cut side down, on an oven safe dish that is coated with the olive oil. Roast in the oven for one hour; remove them when the garlic cloves have browned. Meanwhile, melt your butter in a saucepan, and add in the Swiss Chard. Sauté the chard over medium heat, until the greens are soft. Once the Swiss Chard is soft, add in the salt, pepper, oregano and basil, and sauté for one additional minute. Remove the saucepan from the heat. Remove the garlic from the oven when it has browned. Remove the peels, and add the garlic to the saucepan with your Swiss Chard and other spices. Then, add your chicken broth, and bring the saucepan to a simmer; simmer the mixture for fifteen minutes. Reduce the heat to low, add in your heavy cream, and use a hand blender to blend the entire mixture to a smooth creamy consistency. Once blended, your soup is ready to serve. In early spring, wild leeks (often called ramps) are abundant, and at the peak of flavor. These greens have a delightful, mild taste that is somewhere between onions and garlic. And when you pair them with the latter, they make a delicious soup. If you have hardwood forests nearby, typically those with rich, damp soil, chances are you can find leeks growing there. 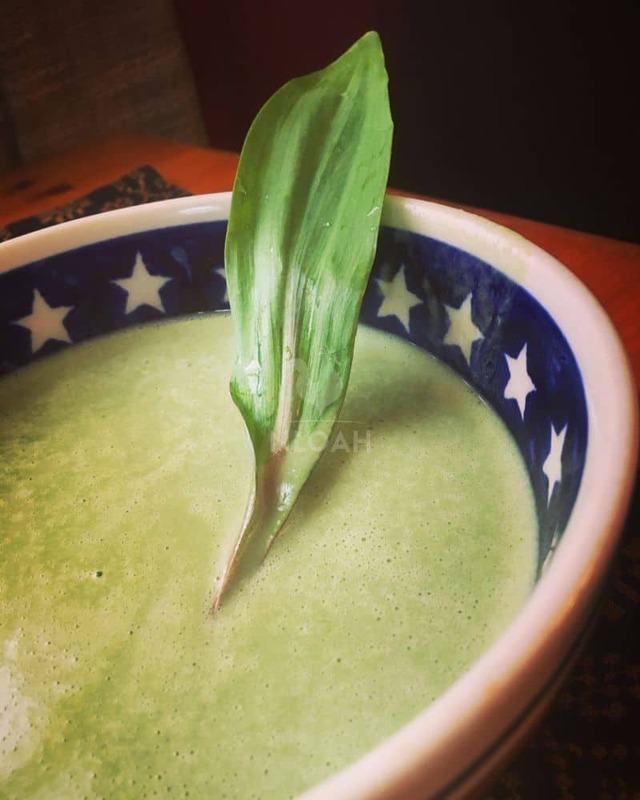 Once you can safely identify ramps and find a nice stand of them growing, it will be time to make delicious wild leek and garlic soup! Place a large saucepan over medium-high heat. Spread your olive oil across the bottom of the pan, and then sauté your onions and garlic. Once your onions are translucent, add the chicken broth, potatoes, salt and pepper to the saucepan. Let the entire mixture simmer for about fifteen minutes. This will help to soften your potatoes. After 15 minutes, add the chopped leeks to the saucepan. Stir the leeks into the mixture, and then let it simmer for another five minutes, so the leeks soften as well. After five minutes, remove the saucepan from heat, and add the heavy cream. Use a hand blender to blend the entire mixture to a smooth, creamy consistency. Once you’re done, the soup is ready to serve. Add a fresh wild leek as a garnish if you really want to impress your friends or family! photo above: a delicious bowl of wild leek and garlic soup, ready to warm you up on a chilly spring day! If you grow garlic on your homestead, you7re familiar with scapes. They are the stringy green tendrils that garlic plants shoot up as they are growing. Garlic scapes are delicious on their own; many people add them to salads or soups. However, when it comes to the garlic harvest, most people don’t give scapes a second thought. Scapes make more than just a tasty garden snack or salad green however. In fact, you can use your garlic scapes to make a delicious pesto. So the next time you7re out in the garden, pick a few scapes, and make a bowl of this delicious pesto. Use it to dip your homemade bread in, or spread it over some freshly cooked pasta. Place you chopped scapes in a food processor and grind them up. Add the nuts, and grind them for approximately thirty seconds. Then, run the food processor, and slowly add the olive oil. Once you’ve added the olive oil, place the rest of the ingredients in the food processor, and continue processing to a smooth, creamy consistency. Once everything is completely processed, your garlic scape pesto is ready to serve! 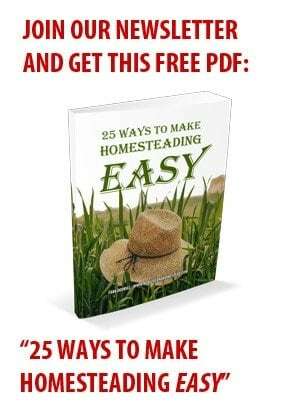 Most homesteaders have one or more varieties of kale growing in their gardens These flavorful greens are delicious, and loaded with important nutrients. However, we often fall into the trap of blanching or sautéing them, and just covering them with butter. Well, if your family is getting tired of your boring old kale dishes, try spicing it up with some garlic and pepper. Place a large skillet over medium high heat. Add the olive oil, and spread it evenly across the heated skillet. Add the freshly minced garlic and let it cook in the oil for one minute, until it is sizzling and beginning to brown. Then, add in the kale, and spread the pepper across it. Use a skillet or tongs to mix up the kale, then cover the skillet and let it cook for one minute. Them, remove the cover, and cook for an additional five minutes or so, mixing the kale greens frequently. Once the greens are tender, they are ready to serve. Most homesteaders strive to preserve the foods they raise, and making beef jerky is a great way to turn a few extra cuts of beef into a delicious, long lasting snack. snack. And guess what? Garlic makes a great seasoning for beef jerky, too. So the next time you decide to make some beef jerky, use this recipe to make a terrific, garlic-flavored snack. So put your dehydrator to work if you want garlic beef jerky on your next fishing trip! In a large bowl, combine all of the ingredients (except the beef), and mix it all into a marinade. Cover the meat with the marinade, and let it marinade for four to eight hours. Afterwards, place the marinated beef in your dehydrator, and set the temperature at 155 degrees Fahrenheit. Dehydrate the beef for about six hours, or until it becomes fully dried out jerky. Once it is dried out, your garlic beef jerky is ready to eat! Another great way to put your garlic to good use is in salad dressings. Garlic, when combined with other herbs you have growing in your garden, can make a delicious vinaigrette. Mix some of this salad dressing up in a mason jar, and use it any time you want to spice up an otherwise ordinary salad. Simply add all of these ingredients to the mason jar, place the lid on it, and mix it up thoroughly. Once it is mixed, add it to your salad as you would any other salad dressing. Store your garlic vinaigrette in the refrigerator, removing it a few hours before your next use. Garlic is one of the most useful and delicious herbs out there. It’s absolutely terrific on its own, and can turn other meals and snacks into something truly memorable. So what are you waiting for? 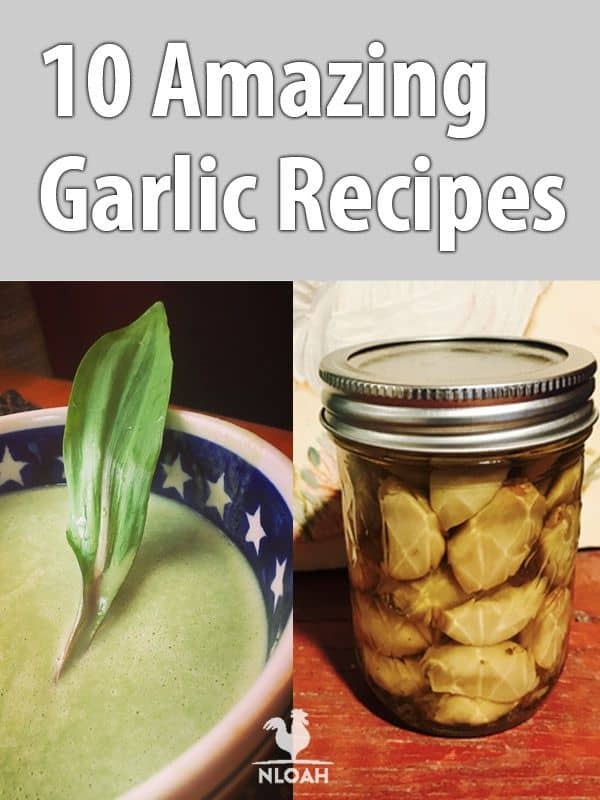 Get some garlic (hopefully you have a bunch of it growing in your garden right now) and try out some of these terrific recipes today! Benefits and Uses for Goji Berries – Nature’s Superfruit!